For this challenge we were to use two playing cards. The front card to have a heart cut/punched out of it and material attached loosely at the back and stuffing then sandwiched between the material and the back card. I used a piece of cream silk that I decorated with red and white lace and a charm heart before sticking to the back of the front card. I cut part of the edging of this lace to border the card and coloured it with ink. 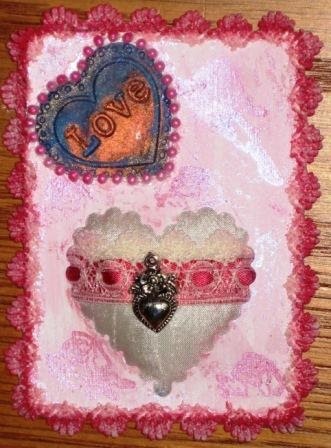 The "LOVE" embellishment was cut and embossed with my cuttlebug and trimmed down and edged with tiny pearl beads. The background of the front card is painted with gesso and then with acrylic paint. I stamped it with roses enhanced with perfect pearls.